Shoot in a Raw file format. You’ve probably gone through a lot of effort to get where you are. Raw capture will allow greater flexibility in resurrecting improperly exposed frames and will ensure that you return home with maximum image quality. Lower your LCD brightness, helping to preserve your night vision. If your camera has live view, turn it off as well, to prevent stray light from being recorded. Remove any filters, protective or otherwise, from your lens. Otherwise, optical interference fringes caused by the interaction of filters with light from the aurora may introduce serious abnormalities into your images. These gremlins usually appear as a series of faint concentric rings. Select the largest lens aperture that will give you a reasonably sharp image. 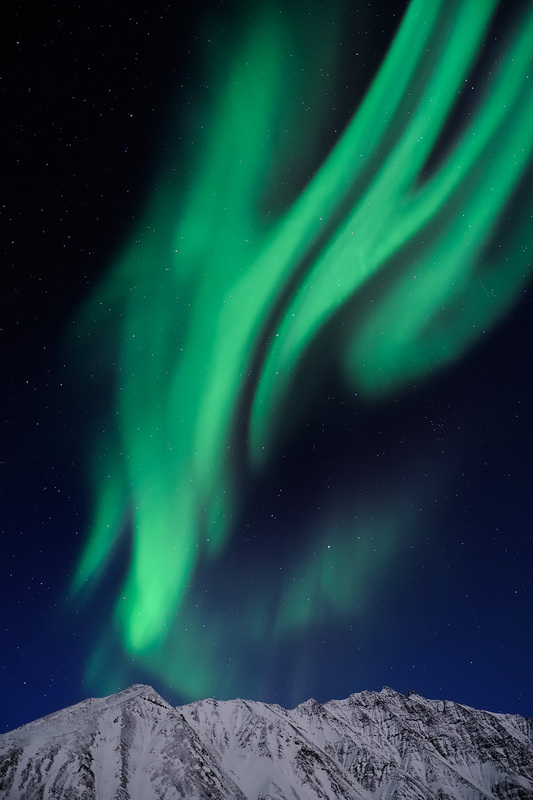 With an active aurora, stopping down in an effort to improve sharpness is often counterproductive. Because the aurora is constantly in motion, longer exposures will capture more of a broad green mist than the detailed structure of the aurora at any particular point in time. Longer exposures will result in increasingly noticeable star trails as well, as the Earth will be slowly rotating relative to the stars throughout your exposure. Choose the highest ISO at which your camera will provide reasonably good quality output. Experiment with noise reduction both in-camera (see the discussion of darkframe subtraction below) and in post-processing. Also, take into account the size of any prints you may desire to make. Focus your lens at infinity. You will need to do this manually, since it is highly unlikely that your camera will be able to lock focus onto aurora. If you are setting up your shot in daylight, set focus on the most distant object or scene element that you can see. If you're working at night, set the focus ring of your lens to the infinity symbol. If your lens is one of the sort which can be focussed beyond the infinity sign on its focussing scale, and you don't have the luxury of having set focus manually in daylight, you will have to establish accurate focus by experiment. Once you have established correct infinity focus, consider taping your focusing ring so it does not inadvertently shift in the dark. Even a slight shift in focus, while using a wide aperture, can render your images worthless. Put your camera into manual exposure mode. Set your aperture wide, to as low of an f/stop as will give you sharp results with your lens. Set as short an exposure time as possible, and ideally well under 30 seconds. Shooting with an aperture of f/2.8 at ISO 800, I typically use exposure times around 4 to 15 seconds, although the duration varies with the intensity of the aurora and artistic preferences. While working with your camera in cold conditions, be careful not to breathe on any surface where you do not want ice crystals to form. This includes, most commonly, lenses and viewfinders. Long exposures, particularly at high ISO sensitivity settings will result in the capture of unwanted 'fixed-pattern noise'. 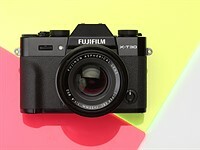 To combat this, most high-end compact and DSLR cameras have a function known as dark-frame subtraction. Very simply, dark-frame subtraction works by comparing your exposure with one of equal length, but taken the camera's shutter closed. This second 'dark' exposure is taken immediately after the main exposure. Any noise which is visible in the 'dark' frame is then subtracted from the captured image. You can also perform dark frame subtraction after the fact, in Photoshop. Take your own 'dark frame' by covering your lens, then in Photoshop, lay the dark frame over the original image, and align the two. Next, select the dark frame layer and change the blending mode to 'difference' and season to taste by adjusting its opacity. 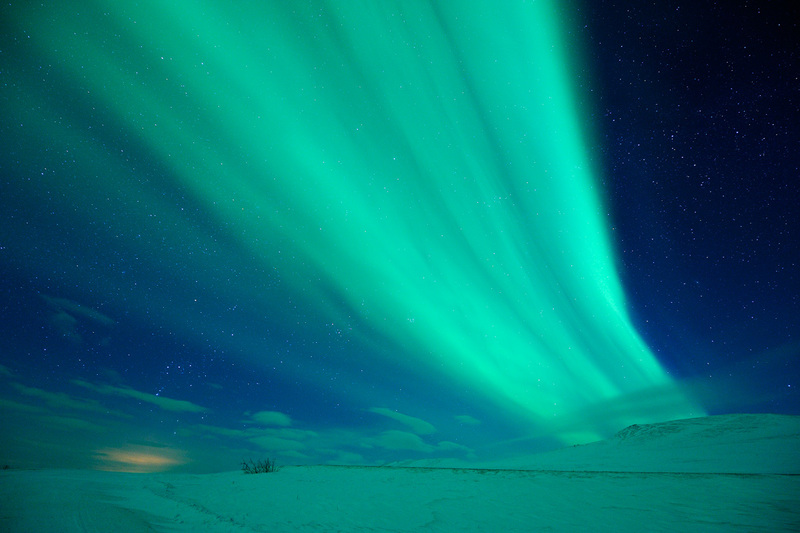 Seeing an aurora for the first time can be an emotional experience. 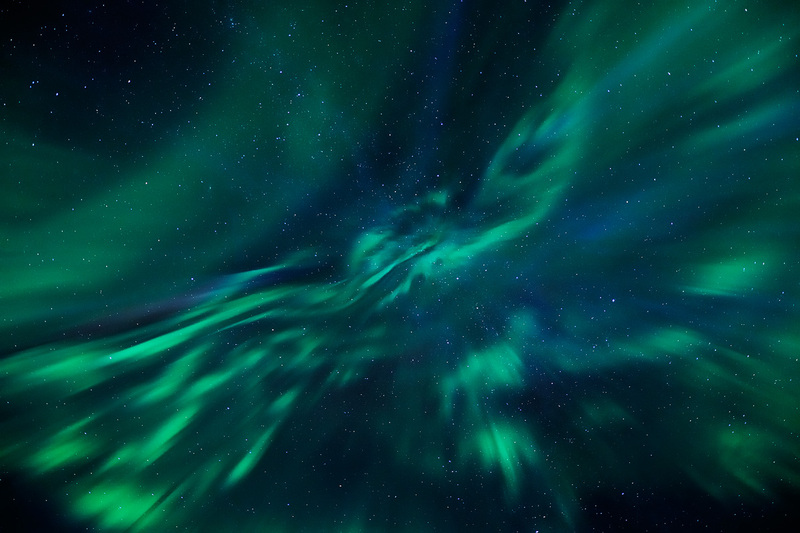 The Aurora is a mesmerizing creature. You will likely remain in awe long after seeing dozens of them. Nevertheless, if your goal is to create memorable photographs, you’ll need to maintain your composure. Resist the urge to indiscriminately snap photos of anything that is green and moving, or to zoom in on an aurora while excluding its surroundings. Think in advance about how you would normally compose a compelling landscape photograph, sans aurora. Most of us would search for elements of interest in both the foreground and background - perhaps patterns in the snow, a pile of rocks, a grove of trees or a mountain, giving clues as to scale and orientation. We would look for leading lines - some structure to guide a viewer’s eye through the scene, and so on. 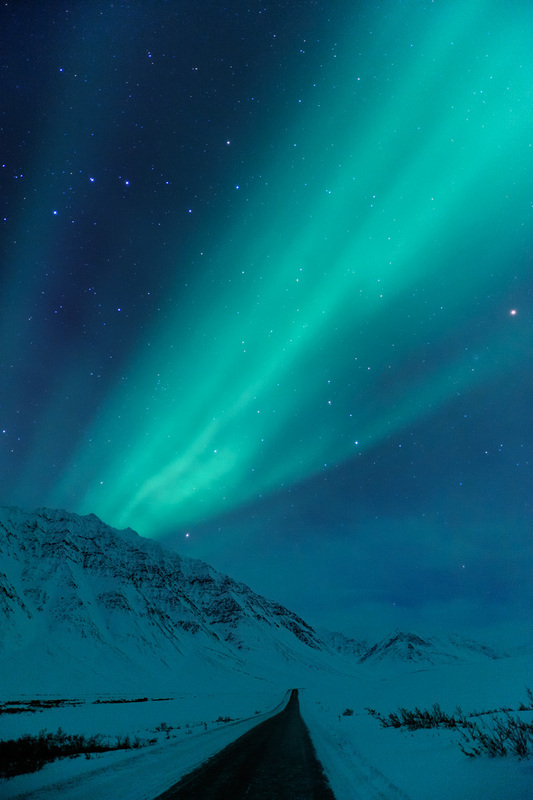 Do not hurl these landscape basics out the window the moment you first glimpse an aurora. Keep them in the forefront of your mind, find a scene that would be worth photographing without an aurora, and then add an aurora to it. If you have the good fortune to encounter a particularly colorful, intense or fast-moving aurora, it may last several hours but will more frequently last just a few minutes. Either way, you’ll never know until the opportunity has passed. My most recent aurora-hunting expedition lasted over a week, but the vast majority of my 'keepers' were captured during a single period that lasted less than ten minutes. If the opportunity arises, find a suitable composition, fire away, and sort out the good ones later. if you want to become a successful aurora photographer, practice is essential. Remember that the speed and intensity of aurorae often change rapidly, so that settings that work well at one moment may not the next. Become accustomed to checking your histograms on-the-fly, and adjusting your exposures accordingly. In addition, review your results in greater detail each day on a laptop computer, and use that process as opportunity to further optimize your settings, to fine-tune your compositions, and to look for any obvious errors you’d prefer not to replicate throughout your entire journey. Light painting: try illuminating your foreground with a hand-held light source. In selecting a light source, pay careful attention to its color. Current LED flashlights, for instance, are highly efficient but commonly impart a bluish color cast. Incandescent bulbs will often be more suitable. Time lapse photography: An aurora slowly dancing across the sky is an excellent subject for time lapse movies. Many modern cameras include not only HD video capability, but a built-in intervalvometer enabling high resolution still photographs to be captured automatically at regular intervals. Experiment with stitching still images of an aurora into a motion picture. Foregrounds: Round out your portfolio with a diversity of foregrounds. Include mountains, paths, snow-covered trees, an occasional moon, reflections in a lake or river, people, a tent or log cabin dimly lit from the inside, and even a slight glow from a rising or setting sun. And don’t forget to occasionally look above; images of an auroral corona often taken straight up and without any foreground, can be stunning as well. 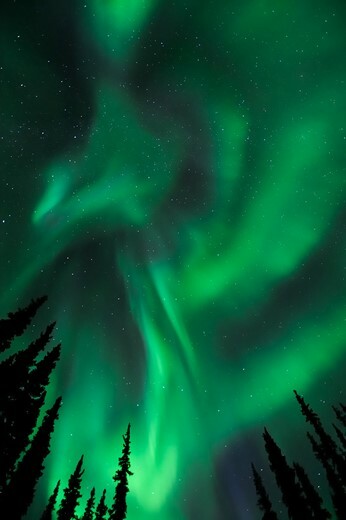 Color: Once you’ve had your fill of the usual green aurorae, you’re just getting started. Hunt for red, violet, purple and blue. Rorschach-ery: Have you ever searched for animal shapes in clouds, or taken a 'Rorschach' test in which you've been asked for your perception of an inkblot? Similar fun can be had with arourae. Anyone see a bird of prey, or perhaps a pterodactyl, in the photograph immediately above section 6 of this article? Post-production: become familiar with high quality approaches to noise reduction in post-processing, and how to manually adjust the color temperature and tint of your Raw files to match the scene you witnessed. The time has now arrived for you to put these lessons to use. Enjoy your journey, and best of luck in capturing one of Earth’s greatest spectacles. Ben is an avid adventurer, conservationist, and wilderness photographer who enjoys exploring remote corners of our planet. Among his favorite subjects are desolate arctic landscapes and the wildlife that inhabits them. 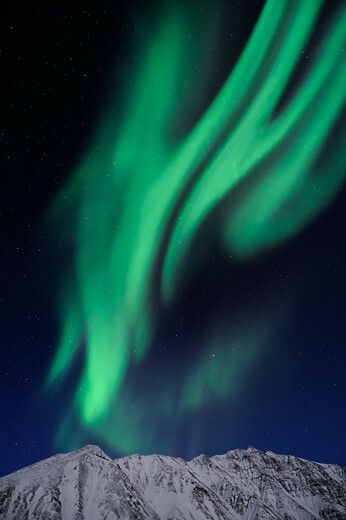 More of his images of the aurora, and other subjects, can be seen at www.benhattenbach.com.